If you are completing the Common Application counselor portion, you will come across a request to include a School Profile. We strongly recommend that you do. Apart from the official high school transcript, Course Descriptions, and the counselor recommendation letter that you write as the homeschool parent, the School Profile offers one more valuable opportunity to showcase how you homeschool. The School Profile is a document that provides important background about your school. It will outline the student body (a size of one, three or eight, depending on how many children you homeschool per grade level), curriculum offered, grading scale and education providers, as well as test scores and demographics of the school district within which you are located. Unless you are explaining extraordinary circumstances, a School Profile is best kept short and factual, within 3-4 pages. Names of school officials (parents’ names and if you like, titles such as director or principal of school). Some homeschoolers like to include the school officials’ (parents’) academic and professional qualifications to lend the document some authority. Go to the National Center for Education Statistics website to search for your local school district’s demographic information. This provides a helpful snapshot of your community’s socioeconomic circumstances such as education and income level. You can also visit sites like Niche to uncover average standardized testing scores in your neighborhood. Admissions committees are often interested in analyzing a student’s background and community before making a decision. Explain why you homeschool — keep it simple, providing at most one or two examples. Avoid ranting about the local public schools. Instead, focus on some of the positive effects of homeschooling on your child. Describe non-traditional homeschooling materials you might have used. List Advanced Placement or college-level curriculum used, including college dual-enrollment if any. Include in-person learning experiences from other avenues such as shop classes, working farms, internships, and so on. List your homeschool’s high school graduation requirements. In my School Profile, I stated that we required X number of credits in Math, English, Science, Social Studies, Foreign Languages, and Electives, and that we aimed to meet or exceed the high school graduation requirements of our school district. Include a list of any class providers you have used (such as online tutors and college professors) and if you have them, their academic and professional qualifications to show why you selected these providers. Explain how grades are awarded. E.g. decide if you want to use the A+/A/A- system that a course provider uses, or if you prefer a simple A, B, or C, and include what range of percentiles are awarded an A, B, C, and so on. Decide how many grade points to award each letter grade. If you grant 4 points to an A, decide if you will weight grades from honors, Advanced Placement, and college-level classes by adding another point value. Calculate and include your senior’s grade point average (GPA). If you have standardized test scores available, report these too. The School Profile is a good place to include a brief list of extracurriculars pursued and awards (if any) that your student received over his/her high school career. It is also the perfect document to explain any unique, noteworthy, or life changing experiences that your student has lived through, especially if this is the reason why you homeschool, or if this is a significant reason for some unusual trends in your student’s grades. As with the Course Descriptions, use easy-to-read font. Arial, Calibri, Helvetica, and Times New Roman are all common choices. Size 11 or 12 might be best. 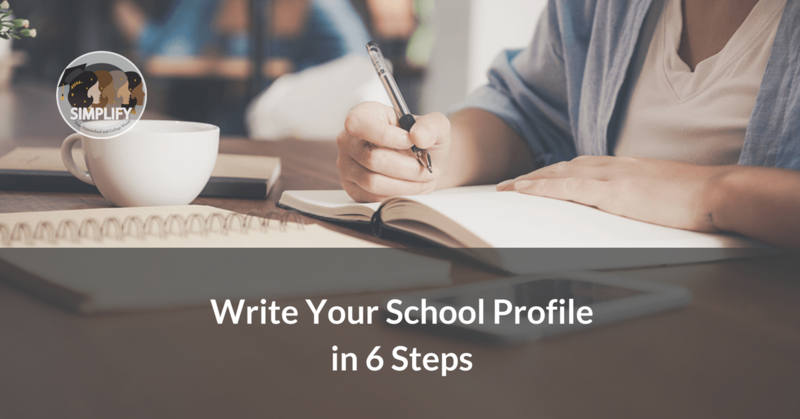 For many parents, the School Profile is a much shorter document than the Course Descriptions and can usually be finished in a day or two as long as you are not feeling compelled to overthink it. It should be kept factual and not be emotional or long-winded. Most adcomms will not have hours to devote to these documents and will simply glance through to understand the most important features of your student’s application and to gain quick insight about your homeschool. See our Course Descriptions how-to here.